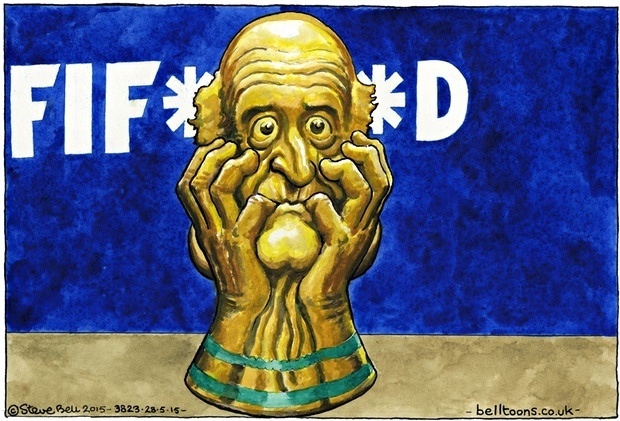 Why the Red Card on the FIFA World Cup of Corruption? 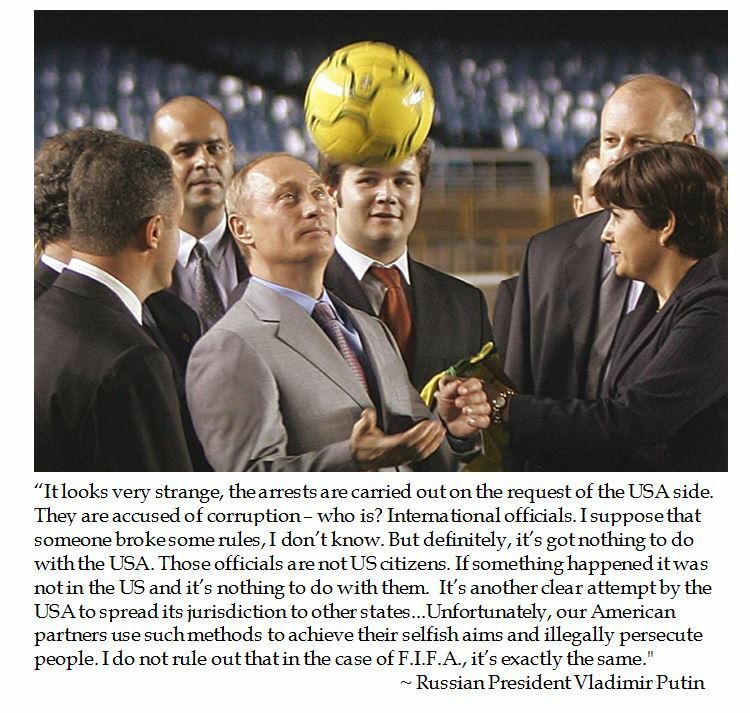 In the wake of Attorney General Loretta Lynch pulling out a red card on 14 F.I.F.A officials for an alleged World Cup of Corruption, Russian President Vladimir Putin opined that the Americans were offsides. It is bizarre that Putin purports that the United States is culminating a three year investigation in order to interfere with the F.I.F.A. election of Joseph Sepp Blatter, but that sort of agiprop distracts from the Russians continuing to mass heavy firepower on the Ukrainian border. But then again, Putin's Russia used the Sochi Winter Olympics as cover for initially invading Crimea in 2014. To answer why the Department of Justice issued a 47 count indictment over F.I.F.A. corruption, it is worth noting that the plots were hatched in the United States and utilized the U.S. banking system. It is wrong to think that the F.I.F.A. case does not affect American politics either. The United States missed out on winning the 2018 World Cup to the Russian Federation's Sochi bid and the out of the box award to Qatar in 2022. The U.S. would be a natural backup in case either the Russian or Qatari bids fall through. Moreover, the Clinton Foundation received between $50,000 and $100,000 and partnered with the Fédération Internationale de Football Association. President Bill Clinton was said to have been so upset at the US losing the 2022 World Cup bid to Qatar that he smashed a mirror. But the Qatar 2022 tried to make it up by giving the Clinton Foundation $250,000 and $500,000 as well as the Qatari government pitching in between $1 million and $5 million. This may only be the beginning of the F.I.F.A. fallout. Suddenly the business of soccer has become very exiting. Goooooooooooool! Before the defense rested its case during the penalty phase of the surviving Boston Bomber's trial, Attorney Miriam Conrad called to the stand Sister Helen Prejean, C.J.S. to testify about Dzhohkar Tsarnaev's character. The 76 year old nun gained renown for her book Dead Man Walking (1994), that has been made into a movie (1996) an opera (2000) and a play written by Tim Robbins (2002). Dead Man Walking chronicles insights of the mindset of convicted murderers drawn from interacting with two prisoners on death row. The experience lead Sister Prejean to become an ardent anti-capital punishment activist. Sister Prejean met with Tsarnaev five times since early March 2015. 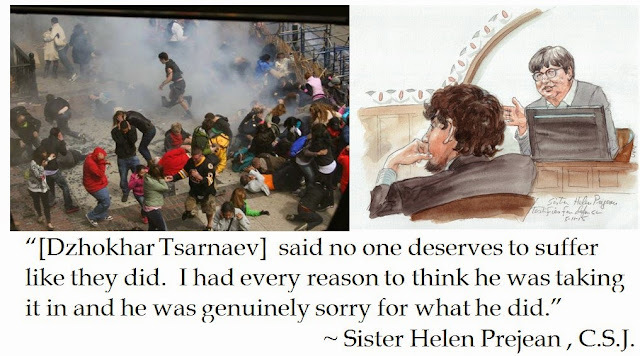 Sister Prejean testified that the 21 year old Tsarnaev brother seemed genuinely sorry for his actions. In fact, Prejean quoted the Boston Bomber: "No one deserves to suffer as they did." Prejean purported that Tsarnaev's "face registered" what he was saying as "absolutely sincere". CNN reporter Deborah Feyerick claimed this was nothing short of explosive testimony. It's a pity that Dzhohkar Tsarnaev chose not to take the stand during the guilt phase, in which he was convicted on all 30 counts, nor during the penalty phase, so that the people could discern if it was real remorse or crocodile tears delivered through an earnest activist. Boston Bombing victims in the gallery shook their heads during claims that Tsarnaev was remorseful. One revealing threat of testimony which was quickly quashed was when Sister Prejean started to speak about comparative religions. Sister Prejean noted that the Catholic Church had become more and more opposed to the death penalty. The prosecution objected on that point (as they had been chary about an anti Capital Punishment advocate testifying in the first place). Defense Attorney Conrad interjected "Let me stop you right there". Was this a quick acquiescence to an inevitable objection or did the Defense not want to be too explicit in revealing their hand to the jury on Prejean's presence? Defense experts note that if one juror objects to the death penalty, then the Defense achieves its objective and Tsarnaev gets a life sentence without parole. It is thought that someone of Sister Prejean's stature might be able to influence the jury. Another ancillary aspect of Sister Prejean's testimony was playing to the look of innocence. Prejean testified that when she first met Tsarnaev: "I walked in the room, I looked at his face and said, 'Oh my God, he's so young!'" . This played into the defense argument about youthfulness and impressionability. 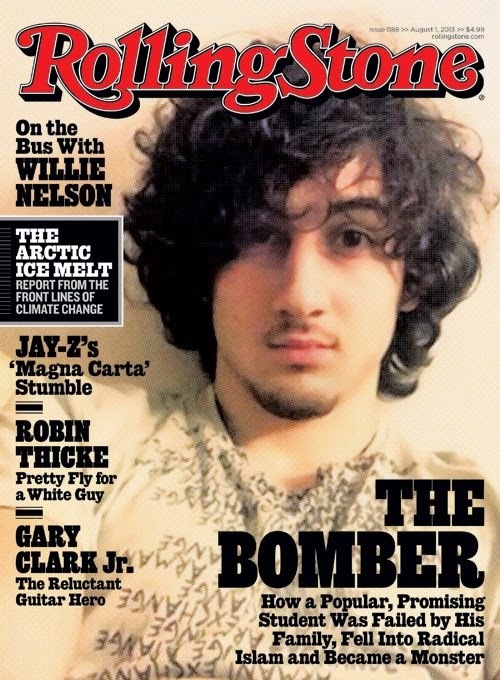 It echoes the Tiger Beat style cover of Rolling Stone. This innocent impression lends more sympathy then the fact that Tsarnaev was convicted of mounting a jihad inspired attack to punish American which killed three people and wounded 264 people. Although it is understandable that an anti-Capital Punishment advocate like the Sister Prejean would want to testify on behalf of the Boston Bomber, it strains credulity that Tsarnaev's defense would rely on hearsay of remorse rather than have the convicted criminal show his true self up on the stand. After eight days of testimony which called upon 44 witnesses, the defense rested its case after Sister Prejean's testimony. The twelve jurors will begin deliberations on Wednesday to determine if Tsarnaev would be in line for a lethal injection or serving a life sentence (presumably at Supermax) without possibility of parole.